Carbon Express is not just a name of a company, it is a brand. This arrow manufacturing company has given the hunters a lot of arrows that have performed better than any other arrows in the market. In our today’s discussion, we are going to talk about a set of carbon arrows that can totally satisfy you. This set of carbon arrows are one the finest arrow sets that have good construction and features. From the top of the shafts to the nocks, every single part is made of quality materials that ensure this set of arrows to be one of the best to use for hunting purpose. As time is passing, technology is being used rapidly in making hunting weapons. So, Carbon Express has made a set of arrows named Maxima Red Fletched Carbon arrows that will definitely amaze you. You will be amazed to know how much advanced this set of arrows is from other ones. Technically it has one of the finest structures to ensure proper penetration feature. There is no doubt that these carbon arrows are speedy and strong enough to reach your level of comfort. When we discuss more these arrows features you will definitely wish for this set of hunting arrows. The straightness of this set of carbon arrows is fantastic. The structure of the arrows is made very carefully so that it remains straight. The straightness of the arrows is 1/10000 of an inch. You should know that the straightness of these arrows is examined and proven right. Nocks are really important part of arrows. Nock is the only part that makes the connection with the string of the bow. So, if the nock of an arrow is not good enough then you will not get proper accuracy and penetration while shooting the arrow. The carbon arrows today we are showing are Maxima Red Fletching arrows. They have nocks that have quality and productivity. You will get Launchpad precision nocks with the arrows. They play a very important role in the performance of the arrows. You will also get Bulldog nock collars so that you can feel comfortable and fascinated using the arrows. One thing is sure that these nocks and nock collars won’t fail so easily. They are capable of performing for a long time. The size of the arrows is eligible. The structure maintains the quality and durability. The arrows come fletched. Blazer Vanes are used for fletching. The nocks of the arrows match perfectly with the shafts. You will also get Dynamic Spine feature from this set of arrows. The main reason behind this dynamic spine feature is the quality carbon construction. This construction helps the arrows to fly better. The construction also brings consistency. The way the arrows manage dynamic spine is mind-blowing. Each arrow has 350-size. The GPI of each arrow is 9.07. The diameter of the arrows is 0.3 inches. All arrows have black and red color combination to look attractive. The structure of these carbon arrows reduces flexing and gives you pinpoint accuracy. Both weight and spine are given perfectly to each arrow by the manufacturer to so that you can enjoy hunting using these arrows. Each of the arrows is fletched with Blazer Vanes. Launchpad precision nocks and Bulldog nock collars are integrated. The hi-tech carbon material is used to control the flexing of arrows. Best dynamic spine construction is integrated to maintain consistency in performance. 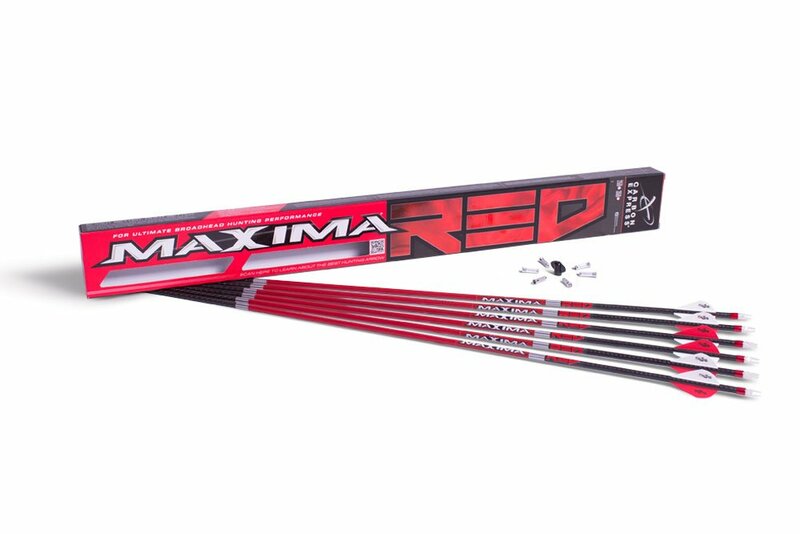 Maxima RED Fletched Carbon Arrows set is one of the greatest arrow set made by Carbon Express. You can fully rely on this product for a long time. It has no record of disappointing the hunters. So, it is sure that these arrows will make a great combination with your bow and will provide accuracy and penetration consistently for a long period of time.